That view is not just shared by blue collar workers. The Wall Street Journal poll found that 53% of respondents believe free-trade agreements have hurt the U.S., up from 30% in late 1999. A proposed law that would have hit US companies moving production offshore with added costs will not move forward in the Senate, ending its prospects for now along a mostly but not completely party-line vote. There was little chance of the bill (the Creating American Jobs and Ending Offshoring Act), which failed a test vote in Senate, becoming law any time soon, but a vote to move the bill forward was called by Senate Democratic leaders to force Republicans to take a position before the November mid-term elections. In the end, most Republicans plus four Democrats and Independent Joe Lieberman voted against moving the bill to the Senate floor for debate in a 53-45 vote. So votes were required to move the bill ahead. Similar legislation had already been passed by the House of Representatives. Democrats say current law gives tax breaks to companies closing US factories for offshore production, which is true or not true depending on how you look at it. The bill would have changed two areas of current tax statutes. In the first case, companies are able to deduct from corporate income the costs associated with a plant closure (e.g., severance payments and other closing costs, which can often run into the millions of dollars or more per closure). The second are is law that allows US companies to defer income recognition for profits made overseas. The US Chamber of Commerce and other business groups had vigorously opposed the bill, saying its passage would hurt the competitiveness of US businesses and in many cases subject them to double taxation. "Limiting [offshore tax] deferral would hinder the global competitiveness of these American companies, impede U.S. economic growth, and ultimately result in the loss of jobs - both at the companies directly impacted and companies in their supply chains," Chamber of Commerce head Tom Donahue wrote to the Senate before the vote. The issue is potentially a powerful one, as changing the tax code might in some cases change the financial equation in terms of the benefits of offshoring. A potential closure of a US factory in favor of one in China or elsewhere for which the cost benefits are marginal might move from "go" to "no go" status under such a new law. “The legislation that was defeated in the Senate today would make US companies pay an extra tax, of up to 35 percent, compared to foreign competitors, and really hit companies like John Deere, where they have big overseas markets,” Grassley said. Countered Democratic Senator Richard Durbin "It's an important political message when the number one issue is jobs," said after the vote. "I want to tell you, I think [the Republicans'] position on this is indefensible." Though the bill was actively opposed by the Chamber of Commerce and other business groups, some in the business community, such as those companies committed maintaining their manufacturing presence on US soil, might actually like to see such legislation move through, as it would impose costs on competitors that decide to move offshore. 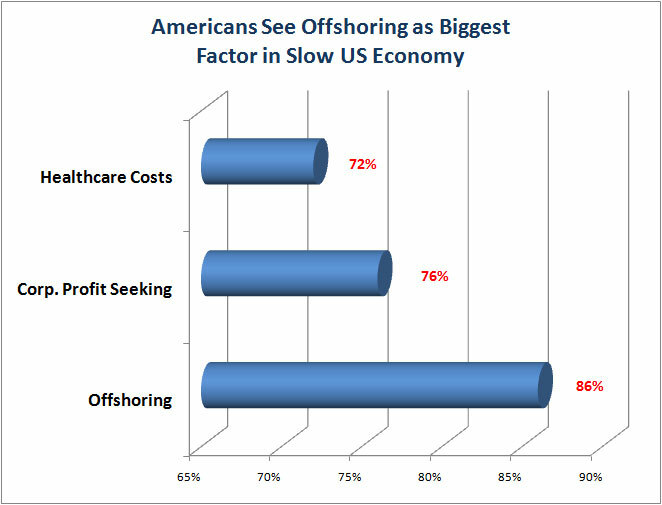 While many Republicans termed the effort a political stunt, the public does view offshoring as an important issue. A new Wall Street Journal/NBC News poll released this week found outsourcing was the top factor cited by Americans as the cause of the country's continuing economic distress. That view is not just shared by blue collar workers. The Wall Street Journal poll found that 53% of respondents believe free-trade agreements have hurt the U.S., up from 30% in late 1999. The shift was mostly attributable to a change in thinking by those in upper income brackets. Do you think the bill would have been a good thing or not? Why? Let us know your thoughts at the Feedback button below.